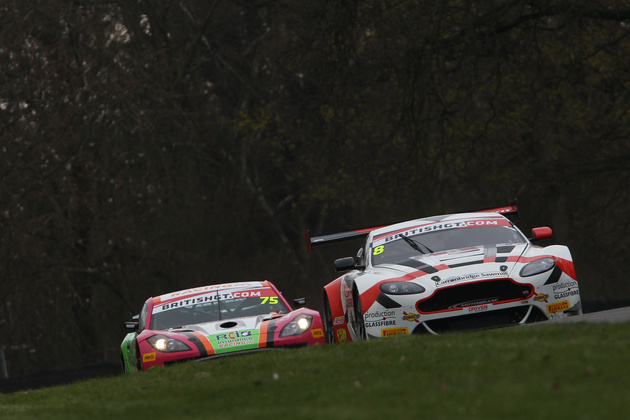 Flick Haigh and Jonny Adam, driving the #75 Optimum Motorsport Aston Martin V12 Vantage GT3, got the 2018 British GT Championship to a flying start by winning the opening round from pole position. Second across the line, and 28.243 seconds back, was the #99 Beechdean AMR Aston Martin of Andrew Howard and, taking the second stint, Darren Turner, Beechdean returning to the premier national GT Championship after a year out to focus on the European Le Mans Series. 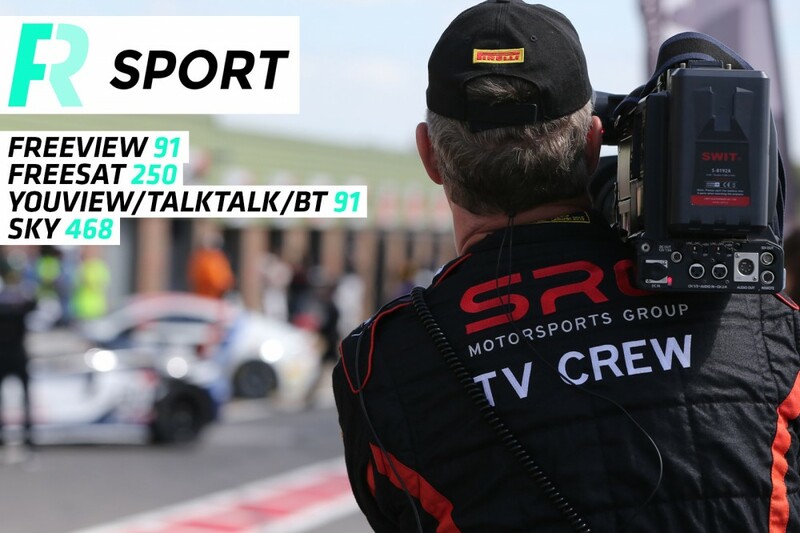 Taking the final podium step in the GT3 category, and pushing hard in the final laps, was the #116 ERC Sport Mercedes-AMG GT3 of Lee Mowle and, driving to the line, Mercedes factory driver Yelmer Buurman. The #116 entry finished just .251 seconds behind Turner in the #99 Beechdean entry. 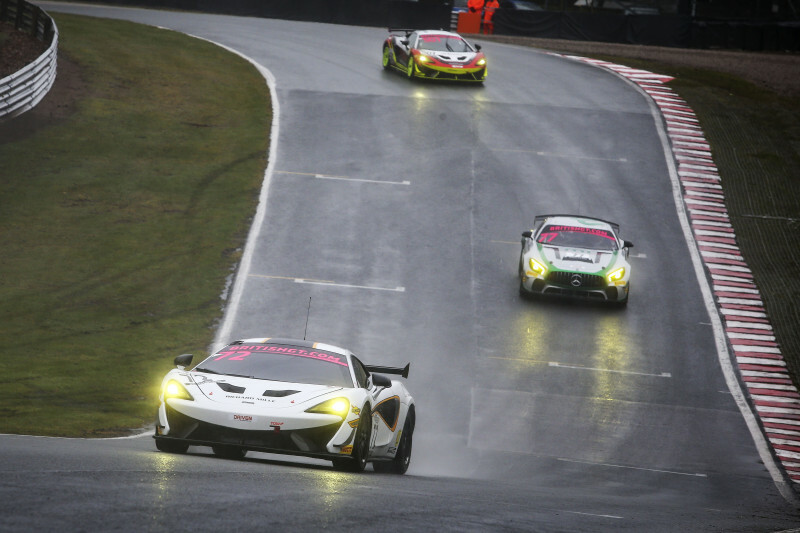 In the GT4 category it was the #72 Track-Club McLaren 570s GT4 driven by Adam Balon and Ben Barnicoat that took the class win. Second in the GT4 class was the #42 Century Motorsport BMW M4 GT4 piloted by Ben Tuck and Ben Green with the final podium position in the GT4 class going to the #4 Tolman Motorsports Ltd McLaren 570S GT4 driven by Michael O’Brien and Charlie Fagg. The race start was delayed by some 45 minutes due to repairs to barrier damage that occurred earlier in the morning. The 60-minute race was started behind the safety-car and was green-flagged after three laps. Due to the slippery conditions, the first few minutes were frantic but Haigh, behind the wheel of the #75 Optimum Motorsport entry held on to the lead with Rick Parfitt Jnr in the #1 Team Parker Racing Bentley struggling in the wet. Join Minshaw in the #33 Barwell Motorsport Lamborghini Huracán took the most advantage of the challenging conditions by moving from seventh on the grid to second, 6.8 seconds behind Haigh in the #75 entry. Andrew Howard in the #99 Beechdean entry also enjoyed a solid start, moving in to third position. As the race moved towards the driver-change and pit-stop window. Minshaw had closed to within three seconds of Haigh with Howard in the #99 car just under 17 seconds behind in third place. After the driver changes had cycled through, Jonny Adam, 2017 24 Hours of Le Mans winner in the LMGTE Pro class, continued to hold the lead in the #75 Aston but Phil Keen, now behind the wheel of the #33 Barwell entry continued to push hard to close to just over a second behind Adam. Darren Turner, meanwhile, in the #99 Beechdean Aston Martin, having taken over from Andrew Howard, held on to third place in class. Bad luck was to hit Phil Keen, however, after contact with the #50 HHC Motorsport Ginetta with Will Burns at the wheel caused damage to the right rear wheel of the3 #33 Lamborghini. 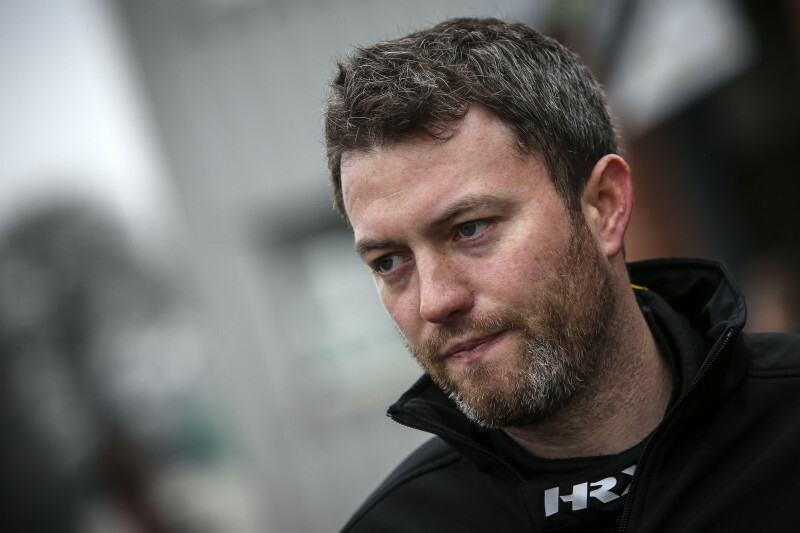 Keen was forced to stop for a tyre change which dropped him out of contention for a podium finish. Darren Turner then took over second place but Yelmer Buurman, now behind the wheel of the #116 ERC Sport Mercedes-AMG GT3 now had the bit between his teeth and pushed the Englishman hard over the closing laps, finishing just over a quarter of a second behind the #99 entry as they took the chequered flag. Flick Haigh and Jonny Adam were delighted at the result in their first time out in the #75 Optimum Motorsport Aston Martin. Haigh was the first to acknowledge the support that Jonny Adam had given her. “it’s helped because he knows the Aston inside-out and inside knowledge is everything so I’ve learned it a lot quicker,” she said. 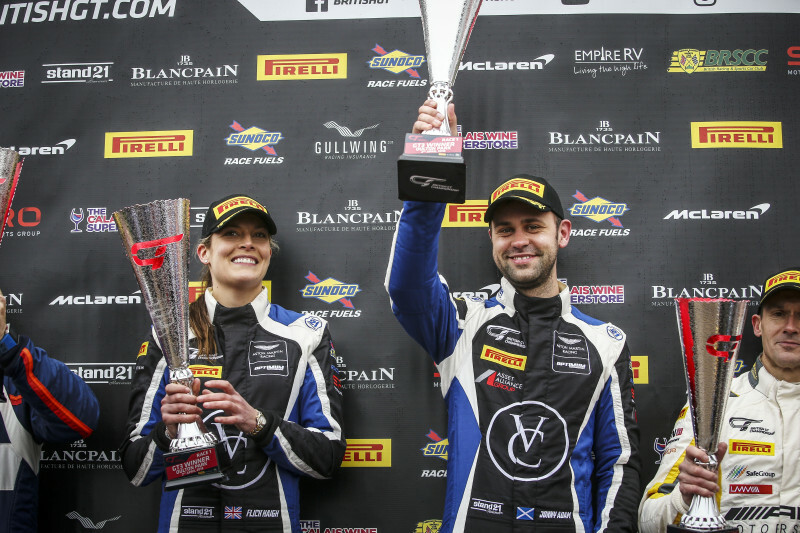 Jonny Adam was pleased for the team to have taken the win in its first race with new car. In GT4 Callum Pointon, driving the #55 HHC Motorsport Ginetta G55 GT4, led the first half of the race from Michael O’Brien in the #4 Tolman Motorsport McLaren 570S GT4 with Ricky Collard, at the wheel of the #43 Century Motorsport BMW M4 GT4 in third. After the driver changes had cycled through, it was Ben Barnicoat in the #72 Track-Club McLaren that held the class lead, with Ben Green second in the #42 Century Motorsport BMW. The top three positions in class remained unchanged through to the chequered flag. Barnicoat is keen to capitalize on the team’s momentum going into Round Two. Team mate Adam Balon was also complimentary of Barnicoat’s drive. Race Two is scheduled for 15:25 on Monday April 2. Amendedment – Subsequent of the end of the race, the #42 Century Motorsport entry was moved down the field as a result of a pit-lane speed infringement. The penalty meant that the #43 Century Motorsport BMW M4 GT4 of Robb Collard and Jack Mitchell was promoted to the final podium position.